When you land on the home page, click the link in the navigation bar labeled Tools. On the resulting page, click the Cool Free Ad Tool link and you jump to the instant template page. In the Title box, type the headline for your description. You can copy and paste prewritten text from Notepad or a word-processing program, or just write your copy text as you go along. In the Photo URL box, enter the URL of your image. In the Shipping Terms box, type the pertinent information (optional). 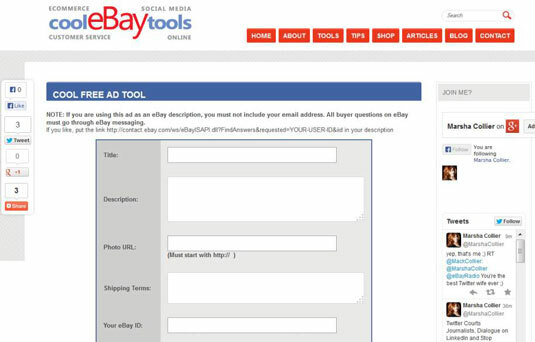 Enter your eBay User ID. The address is used to put code in your description that links to your my eBay messages. Select the border, background, and navigation font colors from the drop-down lists. Type a size for the navigation font as prompted. Click the View Ad button. You see how your new listing description looks. Scroll down until you see a box containing the description’s HTML code. 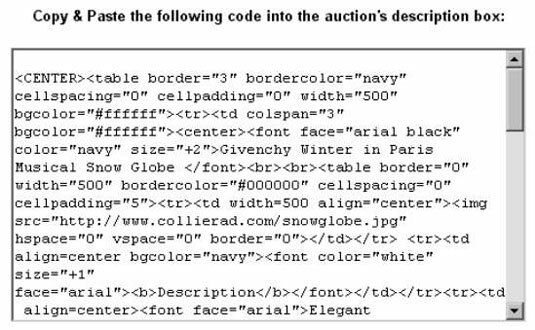 You can copy and paste this code directly into the eBay description area of the Sell Your Item form (or any eBay listing tool). 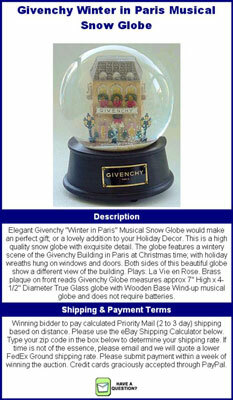 You can also add HTML codes and even another picture to your item description.